Welcome to Disney Springs West Side, where you can experience Walt Disney World's exclusive Cirque du Soleil show, La Nouba. This dramatic mix of circus arts and street entertainment features wild, colorful costumes, magical lighting, and astounding music. Extraordinary California cuisine is available at Wolfgang Puck Cafe, while spicy Latin music awaits at Bongo's Cuban Cafe. House of Blues serves up live concerts, a gospel Sunday Brunch, and soul food that will make your heart sing. 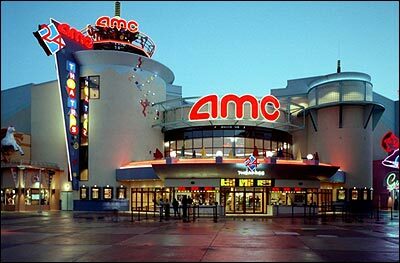 The AMC Theater is the perfect place to relax and catch a new release movie. And now, with Fork and Screen dining, you can have your "dinner & a movie" simultaneously. 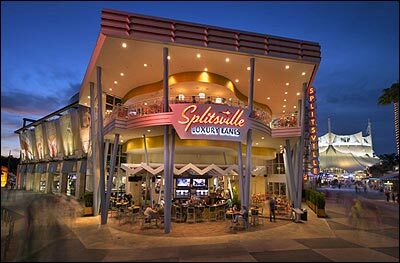 Splitsville Luxury Lanes is a hip bowling alley/night club, where guests can come for a game of bowling and stay for dinner or drinks. Live music keeps this place hopping until 2:00am! Coming in 2017, the NBA Experience will replace Disney Quest. This high energy basketball themed complex will feature hands on activities, games, a restaurant, bar, and shop. A large selection of shops lines the boulevard through the West Side where you will find everything from jewelry to a brand new Harley Davidson motorcycle! Make your way to the West Side and get ready for some fun! Everything runners need to hit the pavement. Featuring full gait evaluations, stride analysis, and targeted footwear recommendations. There is even an indoor track where you can test out several pairs of shoes to find the perfect fit. A large selection of shoes, socks, hydration products and other running accessories can be found here. A unique cigar shop. The Sosa family brings you fresh, hand rolled cigars. You'll also find a large variety of smoking accessories. Bowling, fabulous food, and live entertainment! Splitsville Luxury Lanes is the next generation of bowling alley, featuring family fun and adults only (21 and up) access after 10:30 p.m. on Fridays and Saturdays. Splitsville features 30 lanes of bowling, 2 kitchens, a full bar, live music and billiards! Taking up residence in the former Virgin Megastore, this gigantic space can entertain hundreds of guests at a time. The food is surprisingly good here (see restaurant section below), so plan to eat while you play. Waits can be long for bowling alleys, particularly on rainy days, so be advised. A gift shop called Memory Lane is your one stop shop for bowling themed merchandise and gifts. One of the largest theatre complexes in the Southeast, with more than 5,000 seats available. Comfortable theater and stadium seating with an incredible sound system. For reservations, features and movie times, call (407) 298-4488. A new dining experience called "Fork and Screen" is now available at the theater. Seat-side,table top food and drink service allows guests to enjoy dinner and a movie at the same time! The full menu includes appetizers, entrees, desserts, cocktails and soft drinks. In addition, traditional movie snacks are also available. Tickets must be purchased specifically for this experience and seating is assigned. Guests under 18 must be accompanied by an adult. A small lounge in the lobby called MacGuffins allows guests to enjoy cocktails and food items from the Fork and Screen menu before or after the movie. Cirque du Soleil shows are like no others. La Nouba, the Cirque du Soleil show created exclusively for Disney SpringsWest Side, is presented in a cylindrical structure with 160 foot metal towers. 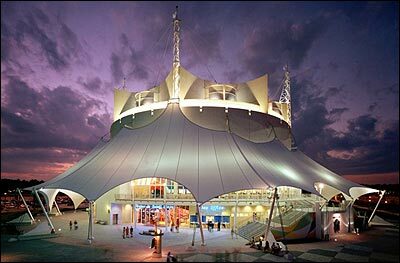 The 70,000-square-foot theater has the look and theme of a circus tent and can seat 1,670 guests. The show is 90 minutes long and entertains with mesmerizing acrobatics, outrageous costumes, magical lighting, original sets and live music. There are no animals in the show. No photography or video taping allowed. Tuesday - Saturday at 6:00 p.m. & 9:00 p.m. Dark days are Sunday and Monday. For more information and to purchase tickets, visit www.disneyworld.com/lanouba or call (407) 939-7328. Reservations can be made up to 6 months in advance. This show is extremely popular, so be sure to buy your tickets early. DisneyQuest is the first ever indoor interactive park. Climb aboard a river raft, grab a paddle, and shoot the rapids in a virtual world. Jump into a motion simulator and ride a roller coaster of your own creation. Fly a magic carpet through the bazaars and alleyways of the distant past, and much, much more. • Children 9 and under must be accompanied by an adult. • Strollers are not permitted inside DisneyQuest and may be checked for free. The unique flavors of Miami's South Beach will have your taste buds soaring with the ultimate in Cuban cuisine, while you sing with the best Latin rhythms in this restaurant. Created by superstar Gloria Estefan and her husband, Emilio, Bongo's features live music on Friday and Saturday night. Get out on the dance floor and get your salsa on! Priority Seating Reservations accepted for groups of seven or more. Counter service location featuring cuban sandwiches, salads, empanadas and Cuban coffee. House of Blues salutes America's most celebrated music live, seven days a week. Including R&B, Rock 'n' Roll, Country, Alternative, World, Brazilian, Jazz, Gospel, and Blues. House of Blues restaurant offers Mississippi Delta inspired cuisine, with traditional southern favorites like jambalaya and homemade bread pudding. House of Blues is backed by Dan Aykroyd, James Belushi, John Goodman, and Aerosmith. Counter service spot serving up southern favorites such as pulled pork sandwiches, smoked turkey legs, and hot dogs. Beer, wine, and cocktails are also available. Chef Wolfgang Puck presents a one of a kind Cafe, with four dining options found in one building. The Express- designed for the guest on the go. A tray service venue with outdoor seating. B's Sushi & Raw Bar - features made-to-order California style sushi, sashimi, and full raw bar. Casual full service dining in The Cafe includes pizza, sandwiches, homemade pastas, fresh seafood, steaks, and rotisserie chicken. Located upstairs, The Dining Room offers an elaborate approach to Wolfgang's exciting cuisine. Recently the recipient of a makeover, Planet Hollywood said goodbye to the large "planet" globe exterior and is now themed to a 1900's style observatory. Although guests will still find movie memorabilia on the walls, the ceiling has been turned into a Planetarium. A new bar called Stargazers has been added along with outdoor seating. The food is still traditional American fare. Serving up surprisingly tasty eats, this restaurant raises the bar for bowling alley food. Freshly rolled sushi, calamari, ahi tuna, and sliders are on the menu along with traditional favorites such as pizza, burgers, sandwiches and salads. A large selection of items is Gluten Free. There is a full bar and the a Coke Freestyle machine, where you can mix your own custom soft drink flavors. Desserts include ice cream sundaes, brownies, and cakes. These four food trucks are set up as a semi-permanent dining location. Haagen-Dazs - Ice cream treats including cones, cups, and sundaes. Coffee drinks and milk shakes are also available. Features hand-rolled pretzels in a variety of flavors, pretzel dogs, fresh-squeezed lemonade and Haagen-Daz ice cream products. Specialty coffee, tea, and frozen blended drinks. Artisan sandwiches and pastries also available. Located adjacent to the House of Blues, this front porch style bar serves up lively cocktails, beers, wine and more. Live music plays nightly. Located inside the AMC Theater, MacGUFFINS offers cocktails, beers, wines, and the full AMC Dine In menu.